Stackable jewelry is all the rage in the fashion world right now, and stackable rings are a great form of jewelry to start with when you’re ready to embrace the trend. “Stacked rings” simply refers to the look achieved by wearing multiple rings on one finger. Often, rings are stacked on multiple fingers and can be worn across one or both hands depending on how dramatic of a look the wearer is trying to achieve. We’ve provided guides on how to stack bracelets and necklaces, and now it’s time to tackle the intricate art of stacking your rings. It’s all about achieving a one-of-a-kind look that expresses your personal style. Mixing metals, sizes, shapes, textures, stones and designs give you endless possibilities. So, whether you’re new to stackable rings or you’re looking to up your ring stacking game, Shop LC is here to help. Familiarizing yourself with midi rings is important because they are imperative to a good ring stack. A midi ring is a ring that sits on your finger above the lower knuckle. They often make for great thin stackable rings, and the best part is, you don’t have to stick to one specific design or metal. You can keep it simple and add diversity by wearing midi rings with spike or arrow designs for a bold look, or exude a sweet disposition by selecting more feminine symbols like hearts or bows. It’s always important to make your ring stack feel personal to you. Mixing metals and textures in fun combinations is a great way to do this. For example, one rose gold ring surrounded by yellow gold creates a beautiful contrast. Or, mixing a white gold ring with stackable rings featuring your birthstone or favorite gemstone is a classic look that never goes out of style. Even simply alternating between gold and silver stacking rings can have a dramatic effect. Add some edge to your hands with spiky rings instead of smooth bands, or pair small diamond rings next to large stones for size contrast. Creating combinations of texture and metals that you love gives your ring stacks a unique balance. Throwing in pieces that you cherish, such as an old heirloom ring, with your new dainty rings will give your stack an interesting (and sentimental) contrast. For example, wearing an emotionally significant vintage wedding band or antique diamond engagement ring that belonged to someone you know with your more modern pieces is a great starting point for your ring stack. Remember, when it comes to how to stack your rings, the more unique and creative your collection is, the better. Many people opt for personalized stacking rings in gold, silver, or another favorite metal. They are often engraved with a favorite word or saying to inspire the wearer on a daily basis. Mothers have heavily influenced the stackable rings trend as well, as many proudly rock rings featuring the full names or initials of their children. 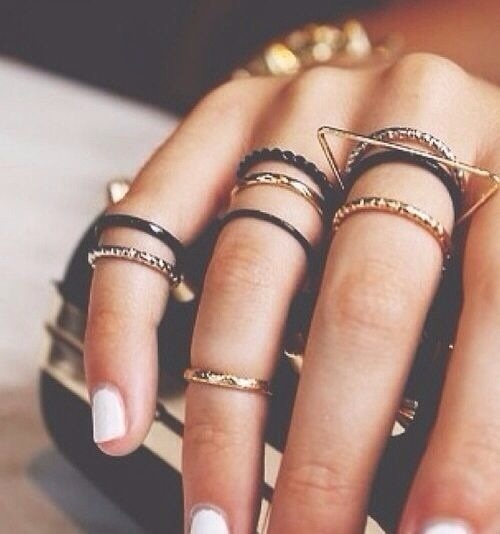 Knuckle rings are flattering and create great contrast, but you definitely don’t want to overload your hand with them. Too many knuckle rings can look gaudy and will weigh your hand down. A good rule of thumb (see what we did there?) is to limit yourself to two knuckle rings per hand. Create negative space by having one finger that is heavily stacked next to a bare finger. It will create an intriguing balance and keep your stack from looking too symmetrical and styled. Or, try a fully stacked finger next to your ring finger that solely bears a fancy solitaire ring or your wedding and engagement band. Your beautiful diamond, birthstone or gemstone ring will really pop when placed next to thin stackable rings in unique shapes like triangles or chevrons. The best ring stack is a significant one that has special meaning to you. You can read a dozen blogs or watch tons of videos on stacking rings, but it all comes down to your unique style. Wear what makes you feel beautiful, and you’ll be sure to enjoy your combination of personalized stacking rings.